"I was inspired by a few different banana cupcake recipes before settling on this one. 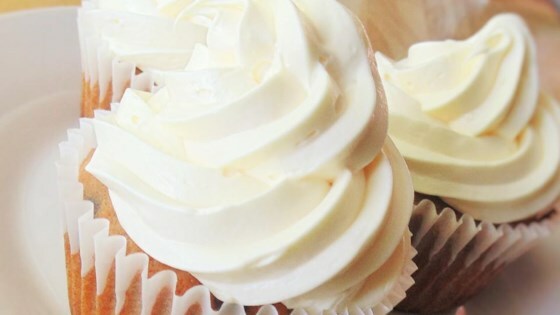 The cream cheese frosting is probably my favorite part; it's just wonderfully decadent on a banana cupcake. Refrigerate cupcakes after frosting. P.S. They taste much better the next day!" Preheat oven to 350 degrees F (175 degrees C). Line a muffin tin with paper liners. Whisk flour, baking soda, baking powder, and salt together in a bowl. Combine white sugar, brown sugar, and 1/4 cup butter in another bowl; beat with an electric mixer until creamy. Beat in egg. Mix in mashed bananas. Add flour mixture in 3 batches, alternating with buttermilk, stirring after each addition. Fold chocolate chips into the batter. Bake in the preheated oven until a toothpick inserted in the center comes out clean, about 20 minutes. Cool cupcakes on a wire rack, about 30 minutes. Beat cream cheese and 3 tablespoons butter in a bowl until smooth. Add vanilla extract. Beat in confectioners' sugar, 1 cup at a time, until frosting is smooth. I love putting chocolate chips in my banana bread, but if you want to eliminate them or substitute nuts or something, all the better. I also like to decorate them with a cute chocolate chip on top. Great recipe though a bit too sweet for my taste. Others loved them as is, and I prefer them without frosting. Would bake again; especially if I have overly ripe bananas on hand! These cupcakes were awesome, they were fluffy and the cream cheese frosting was really good. I will definitely make it again. I received many compliments on them.